Classie Clare’s NY Times Best Selling series, The Mortal Instruments, was on TBR pile for, well, years. I was overwhelmed with piles of books and was reluctant to start a new series, but I was intrigued by the premise. This summer, I was volunteering in the library and ran across City of Bones on audio. The handsome young man on the cover all lit up in gold light reeled me in, and I couldn’t resist any longer (even though the listening time was over 14 hours). I began listening that day and like they say,…the rest is history. 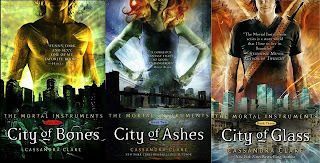 *Please note, this review will cover all three released books, City of Bones (CofB), City of Ashes (CofA), and City of Glass (CofA). Because all three books are discussed, there will be major spoilers for readers. Clary Fray thinks she is an average 15-year-old girl kickin’ it in Brooklyn, until she is thrown into the world of the Shadowhunters - nephilim that were made with angel blood sworn to protect the world from demons - when she witnesses a murder in a nightclub. Three teens covered in strange tattoos and carrying even more bizarre weapons kill a man. Maybe kill is the wrong word. More like, destroy. The murdered man turns into dust and disappears before her very eyes. That night, in a dark and dingy NYC club, began her life, and adventure, among the Shadowhunters. The Mortal Instruments introduces us to the Downworld made up of vampires, fairies, werewolves, angels, wizards, and witches, and more. These are the kinds of creatures that Shadowhunters must keep at bay, keep tame and hidden away from the human world. The Mortal Instruments is told in the third-person with major storylines coming from Clary and the three original Shadowhunters that Clary meets at the club, Alec, Isabelle, and Jace. Clary’s best friend Simon, a human boy that turns into a vampire in CofA, also has a strong voice. I often here that readers do not like to read third-person novels. They have trouble following along with more than one major plot line, and oftentimes, a writer has difficulty keeping literary elements where they belong. Clare doesn’t have any issues keeping the multiple viewpoints under control. In fact, I think she is quite an expert. I am the type of person that watches movies and point out all of the editing flaws. I do the same type of things with books. I look for inconsistencies in setting, descriptions, and movements of characters (how did they get across the room that fast with a gunshot wound? ), but I can honestly say I don’t catch mistakes (if they are there) with Clare’s writing. I imagine her storyboarding the entire novel out divided by characters so nothing slips through. This is all in my imagination, and I have no clue if this how she writes, but whatever she does, it works and I wouldn’t change a thing. Clare has a knack for finding the right time to switch views to another character. We aren’t left alone with someone for too long, and we aren’t terribly upset when we leave a story and switch to another. Clare balances all viewpoints well, and each time, we want just a little more. That is the magic that makes readers unable to put the books down. The cast of characters for The Mortal Instruments is amazing. She includes a wide variety of creatures and paranormals. These books aren’t just about Shadowhunters or just about vampires. They are about a world in which they all *try* to coexist. Clare has written characters of all ages ranging from teenagers to 800-year-old wizards. Each voice is authentic and true. The teenagers don’t fall into every cliché characteristic, and we learn things about the nephilim and downworlders that aren’t in any other story. What I think I love most about The Mortal Instruments series is Clare’s use of imagery. There was never a misstep in the description of a character, battle, place, or weapon. My mind could easily drawn up images of everything described. I hear this compliment given to Clare quite often. It is no wonder why the first book was optioned for a movie. Because this is technically an audio review, I need spend this time complimenting the actresses that read for us, Ari Graynor (CofB) and Natalie Moore (CofA and CofG). Graynor is an acclaimed actress and best known for her hilariously drunken role in Nick and Nora’s Infinite Playlist. You remember her - the girl who fishes her gum out of the toilet of a train station bathroom. Yes, that’s her! She brought a young voice to CofB and I thought it was a fantastic match. When I moved on with CofA, I noticed that the voice was a little different. I looked on the back of the glossy case and sure enough, the actress was Natalie Moore. Moore also read Dairy Queen by Catherine Gilbert Murdock. Although Natalie is obviously a different person, their voices are remarkably similar. I didn’t think the change was a deal breaker and soon, I forgot what Graynor sounded like. Although they do say the word “incredulous” quite differently, and that word happens to appear about 52 times in CofB, not much else is different. As I said before, the audio version of these books are several hours long and require quite a commitment. I would recommend saving them for a long car trip. It took me quite a few weeks to get through the second, CofA, because I was simply driving around town. If you don’t have that long of an attention span or get easily confused jumping between more than one story or book, save these until you have a long stretch of time. Whatever you decide, audio or book, pick up this series! I promise you will not be disappointed!